I'm a (DC) fangirl who always tends to swoon for the smart ones. Which means I swoon for villains as DC has an uncanny way of killing or marginalizing their super-smart Man of Science/Knowledge heroes (Ted Kord, Ray Palmer, etc..). In particular, I adore Noah "The Calculator" Kuttler and Edward "The Riddler" Nigma, and (more the highly-intelligent passionate converse to the Man of Knowledge) Mark "Weather Wizard" Mardon. In due time I will post some other ramblings to elaborate (i.e. the tension between Atom and doppelganger Calculator as narrative engine in Identity Crisis; the many faces of Calculator; Joker's Asylum II: The Riddler as Super Grover Worthy! ; the world of the Flash as a perfect representation of Hermes; etc..), but for now let me get some previously-created Imaginary Puissance-worthy material up for your musing pleasure. To attempt to shorten a long story, I always have to have a male muse. In elementary school from 1st grade on, I picked a boy in my class and that would be that. In my teens through early 20s, it would be a fictional character of my creation amalgamated from movie character and teen idols. In my mid to late 20s, comics characters came to the fore as I delved into the medium. And as I'll probably mention time and again, give me a new creative medium and within a month I'll be creating something in it (whether I stick with it long enough to develop my skills and make anything Good is a My Little Pony of a different color). Inexorably, this led to Calculator fanfiction, and given his nature as a hub for cross-universe going-ons this, innocently, pulled Weather Wizard into the story. 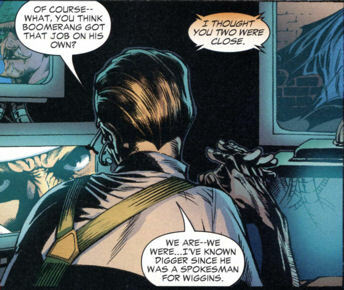 Mardon's side of it was that Noah was too little blue collar, too much dork, and his suit had too many abilities going on that overlapped with what the rest of the Rogues could do. One of the reasons he had stayed away from the Rogues to begin with was because he could do heat like Heat Wave and ice like Captain Cold, and he didn't want to step on any toes.] From a piece of fic I wrote not long before the original version of this post. As my research developed, the coincidences that reinforced this perception of rivalry only added up, until one fateful night browsing a Weather Wizard chronology index, lightning struck and I discovered an issue I already had, and not in my Flash collection. So let me put together a factual chronology of issues here, along with some elaborations and observations, and you can decide the merits as you deem fit. This house sits half a mile from the nearest road, on a lake surrounded by pine woods. The next nearest property is at least two or three miles away. You’d have to work on your yodel, provided the cabins are inhabited this early in the season - most usually wait a few more weeks until Memorial Day. And we’re having a cool spring. So, on the very off chance you’re able to get a hand free and somehow disarm me, get the key and free your other hand, take the room key from its, heh, super secret hiding place, and toddle out on your one good leg, your best bet would be to find the car keys and hobble barefoot across the gravel drive to the car. But then, about that point, as you’ve locked the door and are revving up the engine to flee like a bat out of hell, thanking the stars that you were shot in your left instead of right leg, you’d notice the gas meter just dipping into the red. Now I know you don’t take me for a fool. There is a gas station in the vicinity. Been there myself many times over the years - haven’t forgotten it one bit - practically the only business for miles and miles amid all these backroads. The question for you is, as I’ve potentially caught up to you by this point, do you turn right or left onto the road? Because we are having a cool spring. No telling if you’d notice without your antibiotics or not. Her neck muscles, which had been weak but tensed along with the rest of her in reaction to his presence, gave. Regardless of the dr(how did? )ug fading from her system which numbed against the cold electricity, the eroding chasm, of her failing senses, her consciousness found itself taking refuge in her eyes and the front of her face, a pale glow adrift in sloshing blackness. She didn’t look quite at him, staring ahead at the ceiling. He sat down on the edge of the bed, taking something from the nightstand. She could hear the whisper-quiet tapping of like plastics brushing into one another, like a box of markers. It’s a shame apparently no one’s looking for you. With that, navy satin melted tight over her eyes like the tape inches below. A trio of cuff adjustments later, he had her sitting up and..
Freelance Muse. Geek Girl. Erstwhile Pantocrator.